When you read that, what do you see? I guess now you know if you are a pessimist, optimist, or lunatic. Can you guess which one I noticed first? 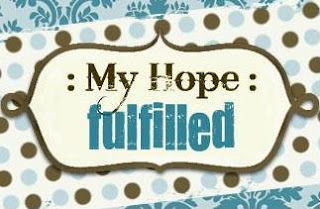 Do you see "My Hopeful Filled?" Or maybe, "My, hopeful, fill Ed." Go ahead, give that cool little logo a click! The teacher who had the opportunity poster in his classroom lived across the hall from the teacher who told me to write what I know. What I know is God is good. I know that I have a crazy awesome story of how I became a mom, but I have an equally awesome story of my journey to wifehood, too. When pertinent, I will still write about the adventures of open adoption and parenthood. But I also want to go back to the beginning and tell you how Prince Charming earned his title. Maybe about the time I almost dropped out of college, and the time I almost died. And if it's not too awkward, I will share some crafts, bargains, and DIY stuff here and there. But mostly, this is going to serve as my place to remember all the blessings in my life. If you subscribe already to my blog, nothing will change for you. In fact, whatever way you use to get to this site, please continue (Facebook, a reader, email deliveries, typing in our adoption blog address). Thanks for supporting me on Our Adoption Adventure, now please join me on the Happily Ever After. Love the "new" blog Michelle! :) Miss you!